I show you the the review of Albion Skin Conditioner Essential which is one of the most ordered lotion for us. The bottle is 110ml, which I often buy for myself. Why smallest bottle, what is expensive ? This is nice product, but not for my daily, and I have to try lots of cosmetics. To be honest, it contains alcohol, I often feel pain when I use such items, but about this Skin Conditioner Essential, I do not feel any pains. That is quite good point. Yet because it contains alcohol, I have never tried when my skin is so sensitive or bad condition. I afraid of having strong sting. As of 2015, for my damaged skin, Skin Conditioner is too strong. I get sting by this lotion. I do not use this now. This lotion is designed as “for sensitive skin”, but I do not recommend if you have damaged/ truly sensitive skin. After applying this product on my skin, I feel as if it make my skin cool down. This lotion/ toner itself is good to moist, especially for oily skin, you may feel refreshed, we are sure. But for dry skin people (like me), this lotion/ toner is working as “booster” of other lotions, if you wanna use. When you wanna use Albion’s milk, after your face wash, “Milk”, and this Skin Conditioner or their “Lotion”. Do not forget something wrap. When you wanna use or you can use other brands things with this Skin Conditioner, apply this first, and go your routine. However I say use as your favorite way :). But I often use this lotion with Hitachi Face Crie (we will tell you later), to remove my dirt in depth of my skin, after my face wash. And I do my routine skin care, that’s all. In this time, I show you the bottle cap. Can you see it is sealed. Actually when people pull up the cover, this seal does not work. But I think they are paying much attention about clearness. 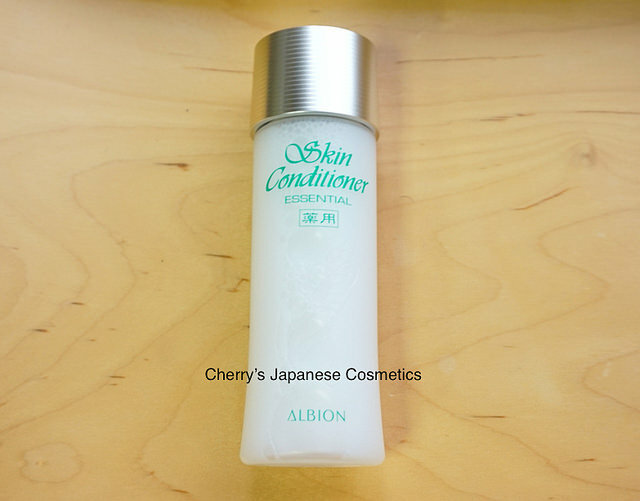 When you obtain this Albion Skin Conditioner Essential, please check it whether it is sealed or not. I got a question from “audience”, “wired” thing, (please guess…) . She is not our “Customer” of us, just an “audience”, and I do not know whom she bought from. 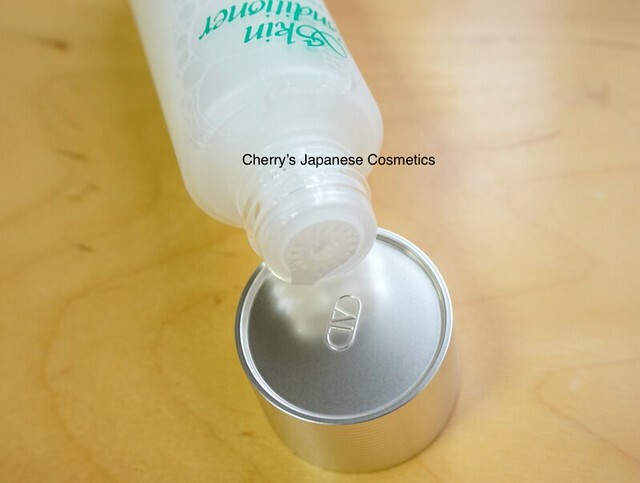 The products what are bought from official stores in Japan are sealed like this, so far as I know. I say again, on her bottle, she is NOT our customer. 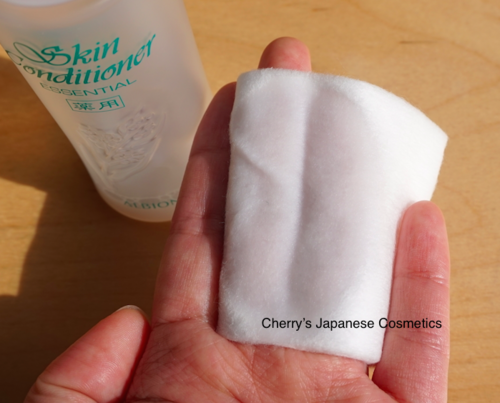 If you wanna use cottons, and Albion (and most of the cosmetic companies excluding Fancl or Dr.CiLabo etc) also recommends to use cottons, maybe because they are producing their cottons. 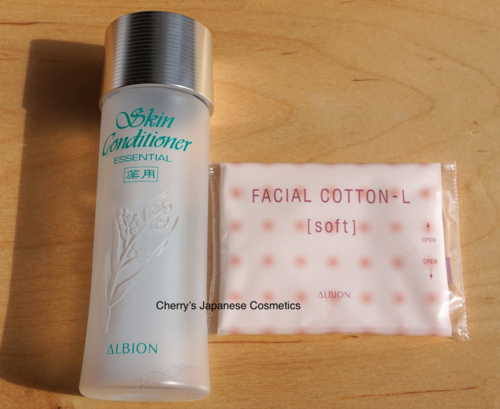 Albion recommends to use their Facial Cotton L (soft). There are other 2 cottons Albion is producing, I will tell you about cottons later, but let me show you the proper quantity of this lotion. This size is a sample size, I asked a girl who often goes to obtain Albion items whether she has something or not. We got search key words as “should i wash face after using albion skin conditioner”. As long as “Skin Conditioner Essential”, you do not need to wash after this product! Check the latest price, and order from here; “Albion Skin Conditioner Essential“. or visit our JPY Branch!